Blockchain, investing, business, and more. In my channel I cover the decentralization movement, from technology to management to society. I want to help you better understand the world, so you'll find a wide variety of topics here. Most of them relate to blockchain and cryptocurrencies, but others are about investing, entrepreneurship, innovation, management, culture, and more. This webinar will cover the history, current, and future of digital scarcity. How can we make digital things scarce and how does that create the Internet of Value? In this webinar, David will explain how blockchains work and how new "token games" are enabling us to create digital economies that will change everything from news to medical research to banking and much more. You'll learn about cryptocurrencies, resource tokenization, token curated registries, curved bonding, and more hot topics from the front lines of blockchain research. David will also include information and take questions about the upcoming Pillar Project conference in Vilnius, Lithuania, where he will be teaching about tokens and digital scarcity. Pillar Project will give a demo of their wallet as a work in progress. The Pillar wallet will be a simple, easy-to-use wallet that will let you store and work with cryptocurrencies and tokens. It will then transform into a combination of eBay and your personal digital assistant. The nonprofit foundation is committed to continuous delivery of wallets and features. This is our chance to show our community how it's going by giving our first real demo of a working wallet. In this one-hour presentation, David Siegel will walk through token design space and explain token business models. David is the author of The Token Handbook, the most comprehensive resource on tokens to date. David will present his token taxonomy and discuss what's happening in the world of ICOs and tokens today. And he'll answer your questions about your token project and ICO. Join us to learn about the exploding world of blockchain tokens! Still confused about this whole Blockchain thing? Interested in investing in digital currencies, but not sure where to start? Want to get a better idea of the threats and opportunities? 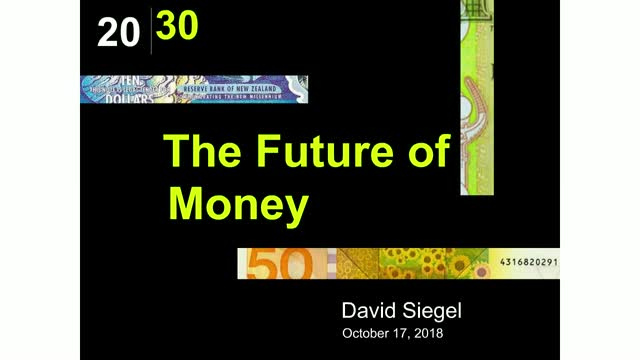 David Siegel is a Blockchain, decentralization and business agility expert who has been a high-level management & strategy consultant to companies like Sony, Hewlett Packard, Amazon, NASA, Intel, and many start-ups. David has been praised for being able to explain Blockchain in the most simple and interesting way. -What is Ethereum? What is Ether? -What is a distributed application? -What is a smart contract? -What is a triple ledger? -What about identity and security? -What business models are at risk?